Combination tools function as tensioners, sealers, and often cutters as well. They save time by eliminating the handling of separate tools. But weighing more than such tools, they should be placed as close as possible to the position where they will be used. Seal-feed combination tools carry a stack of seals in a magazine for fast, easy loading. 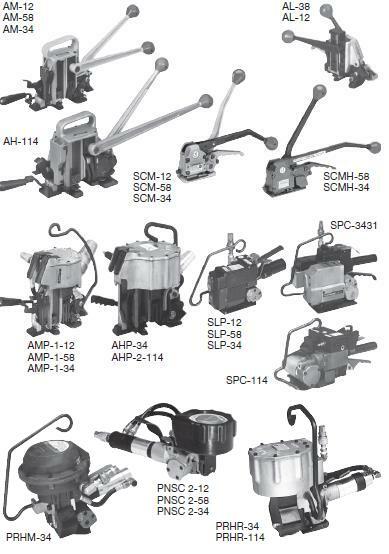 Manual seal-feed - Manually operated seal-feed combination tools include the AH, AL, and AM series models. Manual sealless - The SCM and SCMH sealless combination tools require no metal seals, saving time and money. Production interruptions for reloading are eliminated, along with the purchasing, inventorying and loading of seals. The SCM-Ti series is identical to the SCM series except that it is cast in titanium so that it weighs 30% less and requires 30% less sealing effort than the SCM. Pneumatic seal-feed - Using applied air pressure as a power source, pneumatic seal-feed combination tools quickly and effortlessly tension, seal, and cut the strapping. These tools include the AHP and the AMP. Pneumatic sealless - Pneumatic sealless combination tools include the SLP and the SPC. Pneumatic push-type - Pneumatic push-type combination tools, including the PNSC and PRH-Series models, are used with push-type seals on irregular-shaped packages. Air power tensions, seals and cuts the strapping.